Is Laser Tattoo Removal The Right Choice For You? Tattoos can be beautiful things. Thousands of people are getting comfortable and letting their tattooist ink a masterpiece into their skin. However, there are some who have hopped up into that chair and agreed to a tattoo they’ve quickly come to regret. Whether you simply aren’t a fan of having a tattoo or you just want it gone quickly and quietly, it could be time to invest in laser tattoo removal. However, there’s more to consider than just the price, so we’ve put together a quick guide to help you decide whether laser tattoo removal is the right choice for you. Despite concerns by the public that laser tattoo removal isn’t safe, the opposite is actually true! Compared to alternative methods, the use of a laser to remove unwanted tattoos is actually one of the safest options you have. Fully trained dermatologists can operate a safe laser for the best results under the safest conditions, so it’s best to avoid ‘cheap’ alternatives to be sure. 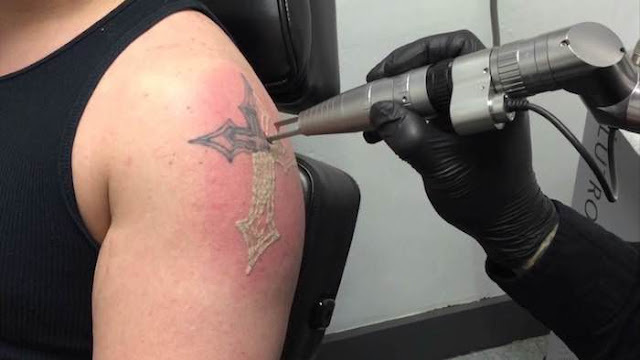 When you have your tattoo removed by lasers, you are essentially penetrating your skin with heat that will target the pigment of your tattoo and break up the colour. As you may expect, this can create a burning sensation though the pain isn’t often any worse than when you get a tattoo in the first place. While it’s possible to find a dermatologist with a laser that gives off cold puffs of air when it’s needed, knowing what to expect before you walk in will help you better prepare for the experience. Additionally, you’ll also be tackling aftercare all over again. It will start to scab, just like your original tattoo so you need to take good care of the area to prevent scarring in the long run. Your tattoo won’t disappear in a single sitting. In fact, it can take upwards of 8 sessions to see any satisfying results. These sessions won’t be in a short span of time, either. You’ll need to give the results of each session a chance to heal, so you could be waiting between 8 and 12 weeks before being able to walk in for another session. You’ll need to accept that it can take over a year for your tattoo to be removed completely. To make matters worse, there’s no guarantee that your removal will work. Certain skin types, tattoo colours and even the condition of your aftercare can all make a difference as to whether your tattoo completely disappears or simply fade. Red, yellow and green inks are notoriously difficult to remove, and tattoos that were done by amateurs or lesser experienced artists could also prove hard to get rid of. Dermabrasion – this is the act of rubbing away layers of skin to remove the pigment of the tattoo. This will encourage new skin to grow but usually causes scarring that can be worse than the original tattoo. Excision – This is the process of cutting away the tattoo – literally. While this isn’t advised for larger tattoos, small tattoos could be cut away from the skin for removal though this is, of course, prone to scarring. Creams – tattoo removal creams are becoming increasingly popular due to their ease of use and affordability. However, these aren’t an approved method of tattoo removal so it’s best to avoid these where possible.